I am a complete Dickens nerd, a Dickensian through and through. In my opinion, he is without question one of the greatest authors of all time. If you have never a Dickens novel, please pick one up. While I have not yet read all of them (and how exciting to think I still have new stories to enjoy), I have read quite a few, loved each, and would recommend any. I have even participated in perhaps the grandest yearly event of all Dickens-lover culture, the annual week-long Dickens Universe conference held at the University of California, Santa-Cruz. I posted about this before when I attended the 2014 session. Each year the conference selects one or two Dickens' novels and the entire week is full of classes, lectures, presentations, and sessions focused entirely on discussing that particular work (2014 was Our Mutual Friend). This may sound like a nightmare to non-readers, but for a geek like myself it was perhaps the coolest extended literary conversation in which I've ever participated. Not to mention that the week is capped off with a true nineteenth-century style ball--ridiculous, hilarious, and so much fun. In 2015, I also attended the follow-up grad student conference. You can read more about Dickens Universe here (this summer they're discussing Dombey and Son). P.S. If you're a Harry Potter fan, Professor Sprout is often in attendance. Yep, totally true. I recently reread Oliver Twist in an informal book club with my dad. He's always loved the musical Oliver! but had surprisingly never read the novel. I bought him a copy, grabbed my own well-worn edition, and dove in. Oliver Twist is a forlorn orphan, trying to survive in the cruel, underfed workhouse conditions of nineteenth-century England. Having never known his father and lost his mother shortly after his birth, Oliver has never known love, acceptance, or friendship. Oliver survives the workhouse, narrowly escapes a would-be death sentence if sent to be a chimney sweep, and spends some time as an undertaker's apprentice. Exhausted from mistreatment and abuse, Oliver runs away, determined to walk to London and make his way on his own. Faint and famished, he finds food and shelter when he crosses paths with odd child named Jack Dawson, also known as the Artful Dodger. Dodger brings Oliver to meet his boss, an elderly, shifty man named Fagin. Their dwelling is dirty, Fagin seems to be hiding something, and Oliver soon learns that Fagin and his band of boys are thieves. They teach Oliver their trade and he meets Fagin's ominous associate Bill Sikes and Sikes' girlfriend Nancy. Oliver's first day back out on the streets he's mistakenly fingered for his friends' crimes and ends up facing a courtroom sentence. While a kind gentleman named Mr. Brownlow has taken pity on Oliver and offers him a home and a refuge, Bill Sikes cannot let the young boy walk free. Convinced that Oliver will soon spill their secrets to the authorities, a war begins over Oliver's safety, freedom, and life. The scenes where Oliver lies near death after running away from his past always breaks my heart and remind me of Jane Eyre's plight and homelessness after running from Mr. Rochester. The character of Nancy--a poor street woman who experiences a change of heart but is convinced she can only save others because it's too late to save herself--is one of the most moving portrayals of abused women in Victorian literature. 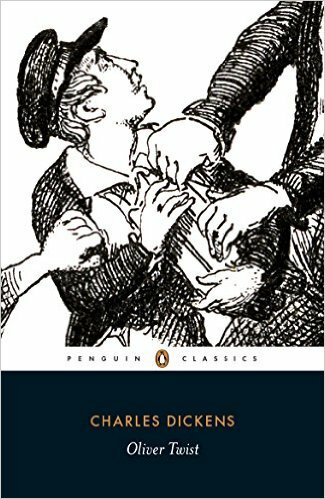 Oliver Twist is a powerful narrative of poverty and child labor conditions in nineteenth-century England, a story that holds the test of time and continues to motivate readers to fight to protect our innocent. "Great Expectations" is one of my favorite books, too! We're such kindred spirits. But, what did Dad think?? Ha ha--he's very close to being done but he's still finishing it! (I'm impatient.) He has talked to me about how moving and sad the depiction of children and poverty is in the book. He's also commented on the excellent writing, so I'm happy to have converted another reader.